Put slippery textures on a large piece of paper, tray, or a cookie sheet (eg., shaving cream, hand lotion, sloppy mud, wet sand). 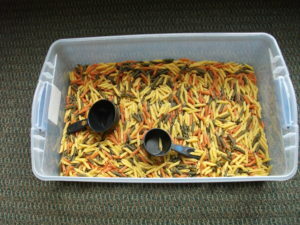 Play with playdough, sand, uncooked rice or/and beans. Google “goop, slime, and gak” recipes to make. Hide little toys and coins in putty for a treasure hunt. Make a car wash using a bin of soapy water, mini cars, and towels. Do crafts. DLTK’s has easy and free printable preschool crafts. Use a jump rope or chalk to draw a makeshift balance beam. Find a good children’s yoga video. Animal walks: bear walk, crab crawl, fly, slither, crawl, gallop, prance, etc. Other walks: wheel barrel walk, skip, walk fast, walk slow, run, tip toe, etc. Songs: Ring Around the Rosy, Head Shoulders Knees and Toes, If You’re Happy and You Know It, Hokey Pokey, musical chairs, or blast some good music and have a dance party! Use large pillows/bean bag chairs to build a mountain. Climb to the top and jump crashing down. Heavy work: help to carry grocery bags, help to put groceries away, help load wet clothes into the dryer, take out a bag of garbage, clean tables and windows, make the bed, and/or carry a heavy watering can to water flowers. Wall pushups, wheel barrel walk, sit ups. Use a bed or couch as a crash pad. Pick up your child, and safely throw him on it. Follow a daily schedule board. Play basketball, kick a soccer ball at a target, play with a ball (roll, throw, catch, bounce, dribble, bounce & catch), or ring toss games. Build tracks and ramps for cars and marbles. Read books and talk about them. Play with blocks and legos. Have a water fight with spray bottles, squirt guns, and hoses. Use the hose to water the garden. Use flashlights on a rainy day, at night, or inside a tent. Sing songs. Sing loud. Sing softly. Hum a song. Imitation Songs: Sing three word and have the child imitate the words in the same manner. Create a rhythm with instruments or clapping and have the child imitate the same rhythm. Listen to calming music. Yoga and relaxation stations are great. Make scented index cards with spices from your spice rack. Describe the smells. Go apple picking and strawberry picking. Pick vegetables out of a garden. If you need more help, please check out my Sensory Diet post or contact us directly at Above All Therapy.